Home / News & Events / A Great Day For Golf During Day 4 Of The 9th Annual All Seniors Care Seniors Games! On Day 4 of the 2018 All Seniors Care Seniors Games we proved that golf is definitely NOT a Good Walk Spoiled! Play the game we did, it was truly a beautiful day on the links! With over 350 participants competing for medals, golfers showed off their best swings to enthusiastic audiences as Wii golfing tournaments were completed across the country. The crowds were on the edge of their seats as our finalists birdied their way to the medals. We’ve never had such an exciting year of golf as this year! • What’s the difference between a golfer and a fisherman? When a golfer lies he doesn’t have to bring anything home to prove it!!! • Why do golfers always carry a spare pair of trousers with them? In case they get a hole in one. • Golf balls are like eggs….They’re white, sold by the dozen and a week later you have to buy more…..
• If it goes to the right it’s a slice, if it goes to the left it’s a hook, and if it goes straight it’s a miracle. Across the country hundreds of older adults will continue to take part in the Games during tomorrow’s final day of competition when Card Sharks will be present. Any and all spectators are welcome! 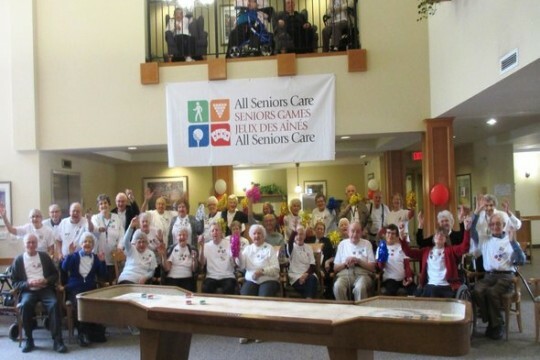 Congratulations to all our medalists and participants for making Day 4 of the 2018 All Seniors Care Seniors Games was a swinging success. Caddies were not needed today, but our staff and volunteers were! Without them, the Games would not be possible, so a big thank you and congrats to all.